I have combined my critter tanks into a 150 gallon tank. crickets from the other vivaria + a wide assortment of fish and turtle food. Everyone in this tank eats copious amounts of dark leafy greens. The painted turtle is struggling to get up. 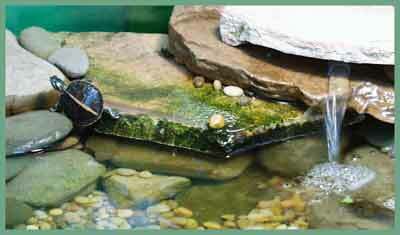 Hiding under the fall is the mud turtle. 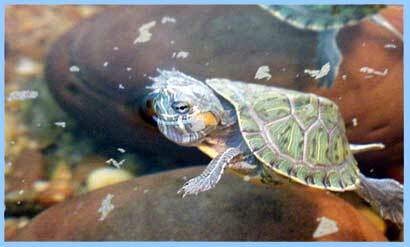 One of the red-eared sliders. They have doubled in size in just one week. 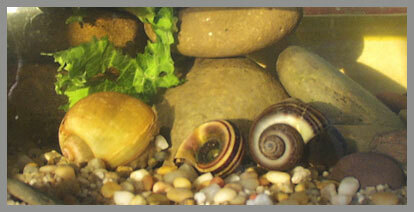 The three main snails posed for this shot, of course.